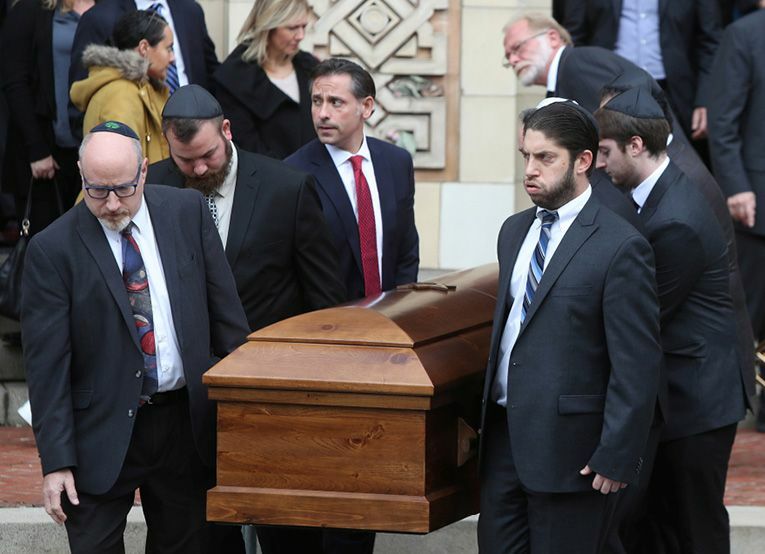 Synagogue slaughter, mail bombs stun the U.S.
President Trump was greeted by protests while visiting Pittsburgh in the aftermath of the attacks, after he rebuffed the Democratic mayor’s request for him to stay away until after the funerals. Demonstrators carried signs saying “Words matter” and “President Hate is not welcome in our state.” Trump pushed back against criticism that he encouraged the recent wave of violence with his rhetoric, blaming “the Fake News Media, the true Enemy of the People” for stoking anger. “A real leader would try to bring the country together after a tragedy,” said The Boston Globe. Instead, President Trump is blaming everyone but himself for a hateful political climate that has emboldened violent extremists. Trump has openly endorsed violence against his critics, praising a congressman who body-slammed a reporter and encouraging fans at his rallies to “knock the crap” out of protesters. And when white nationalists and neo-Nazis marched through the streets of Charlottesville, Va., last year chanting “Jews will not replace us,” Trump infamously said they included “some very fine people.” From there, it’s easy “to connect the dots” between “the bully in chief” and Pittsburgh. Trump’s defenders note that his son-in-law, daughter, and grandchildren are Jewish, said Charles Sykes in WeeklyStandard.com, and that he is staunchly pro-Israel. And yet he “has clearly given oxygen” to anti-Semitic narratives. During the closing days of the presidential campaign, Trump ran a shocking TV ad portraying Hillary Clinton as secretly conspiring with “global financial powers” to rob “our working class.” The ad showed pictures of Goldman Sachs CEO Lloyd Blankfein, Democratic donor George Soros, and Federal Reserve Chairwoman Janet Yellen—all Jews. His campaign also retweeted an image of Clinton inside a Jewish star. When prominent Jews and Jewish journalists criticize Trump, they are invariably inundated with anti-Semitic threats and images of concentration camps—actions Trump has refused to denounce. It’s not an accident that the flagrantly anti-Semitic alt-right and white supremacists believe Trump is on their side. Cover illustration by Howard McWilliam.